Watching Saturday night’s Slam Dunk competition was like watching a train wreck. But it wasn’t one of those quick ferocious crashes that are over in a matter of seconds. No, it was one of those slow-motion Michael Bay-esque train wrecks, that takes about 50 times longer than it should until everyone watching looks at their watch wondering when it’s going to be over so they can move on with their lives. It’s bad. I mean really bad. It’s on par with a really bad Adam Sandler movie, or a really good Rob Schneider movie. So how did we get here? When did the NBA’s Slam Dunk competition become as entertaining as a mediocre D-list celebrity? This thing used to be huge. We’re talking Cindy Crawford in her prime huge. 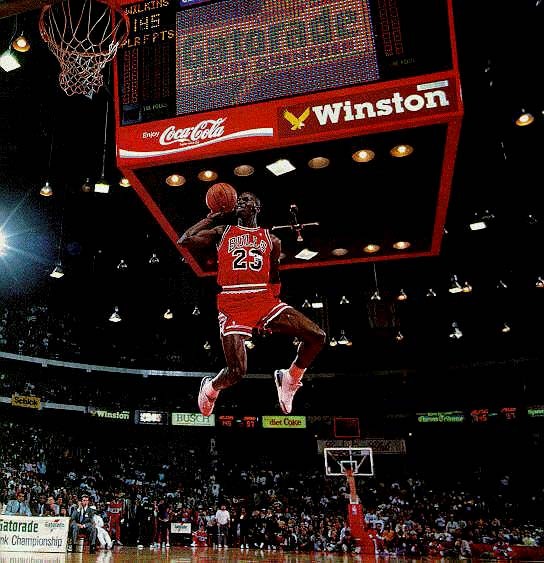 Even non-NBA fans would tune in to watch the dunk competition. It wasn’t just a footnote of All-Star weekend; it was the whole damn book. So let’s take a look at what happened to the once great Slam Dunk competition. The list goes on and on. Point being, you wanted to see these guys throw it down as hard as they could. Dunks were memorable not just because they were spectacular, but because of the players who did them. Dr. J’s Free Throw Dunk, Jordan’s BETTER Free Throw Dunk, 5’7” Spud Webb’s ridiculous performance, Kobe’s between the legs, Carter’s elbow dunk. This was pure athleticism at its best, the crowd was raucous, and more importantly it was just plain FUN to watch. You wanted to see what these guys could do, and how far they could push the limits of a human being dunking a basketball. Now, the allure is gone; but more importantly the players are gone. If you didn’t watch this year’s Slam Dunk competition, I’ll give you $1,000 if you can guess all 4 participants. Lebron James, you say…no. How bout Dwayne Wade…no. Dwight Howard, Blake Griffin, Derek Rose, Carmelo Anthony. Ha, not even close. Try, Derek Williams, Paul George, Chase Budinger, and Jeremy Evans. That’s a rookie, two second year players, and Chase Budinger, who probably dunked more times in this competition that he has in his 3-year NBA career. Yeah, I’ll be hanging on to that $1,000. How do you even sell tickets around that line-up? The marketing guy who can promote that should win some kind of award. Jeremy Evans ended up winning it with some “OK” dunks I guess, but there lies the next problem with the dunk contest. I know what you’re thinking, but the props are so creative. Aren’t they so entertaining? Remember last year when Blake Griffin jumped over a car? Remember when Dwight Howard dunked on two basketball courts? Remember when…just stop, right now. They’re gimmicks people. They’re props used to try and create the illusion of something more impressive than it actually is. Seriously, watch Blake Griffin jump over the car again…watch it. Now take away the car and what do you have? A pretty mediocre dunk at best. Hell, watch Griffin’s top 10 in-game dunks…every single one of those is way more impressive than his jumping over the car dunk. It’s just a gimmick, and unfortunately that’s what now defines the Slam Dunk competition. Don’t believe me. These are some of the things that have been used in the past few years in dunk competitions. A car, A cupcake, A plastic basketball court, other players to jump over. This sounds more like a circus act than a dunk contest. What’s next? A player gets hit in the face with a pie by a clown before he slams it home. Is that really better than watching Jordan dunk from the free throw line, or watching Vince Carter do a 360 windmill dunk? We’re one step away from the Slam Dunk competition turning into NBA’s version of David Letterman’s crazy pet tricks. Let’s watch as Chase Budinger tries to dunk while throwing his pet Chihuahua throwing a flaming ring of fire. Participants feel obligated to think of some crazy gimmick in order to entertain the fans and have a chance at winning the dunk contest. Come out and just attempt a regular old-fashioned amazing dunk…you get booed off the court. Watching Jeremy Evans crotch plowing into the back of Roy Hibbert’s head is the reality of the Slam Dunk competition today. So David Stern, for the love of all that is holy and great about the NBA, get rid of the Slam Dunk competition before Adam Sandler comes out in drag while Gordon Hayward tries to dunk Rob Schneider into a giant basket of chocolate pudding…actually, check that, cancel the competition after this. Height: 6-6, Weight: 285 lbs. North Carolina defensive end Coples may be one of the best defensive end prospects for the 2012 draft. He has the most at stake, but also a lot to gain. After coming off of an outstanding junior season, he dropped off a bit in his senior season. He is one of the top pass rushers in the draft, but if his performance does not stay consistent, people will continue asking why he didn’t have the great senior season he was expected to have. This will be a huge week for Coples and he needs to perform exceptionally well on the combine stage. Height: 6-2, Weight: 220 lbs. The QB spotlight this year will be on Andrew Luck and Robert Griffin III. 2011 Heisman Trophy winner, Griffin will likely wait to throw and save his pro day for March 21. In the meantime he’ll be focusing on team interviews, the 40-yard dash, and other drills this week in Indy. He has the speed and agility, like Michael Vick, to move around in the pocket but will need to maintain his strength in order to keep it up. He should be easy to spot working out, wearing those festive socks he loves so dearly. Height: 5-10, Weight: 191 lbs. After shining in Florida, then getting dismissed from the Gators for drug-related incidents, Jenkins played his senior season at North Alabama. He was great, and really showed people he has first-round talent. He played well in the Senior Bowl, but must interview well and explain himself at the combine. As long as he shows people his baggage is behind him and he is really trying to mature and focus solely on football, the Detroit Lions may come knocking. They have drafted well over the years and are in need of a cornerback this draft. Height: 6-6, Weight: 306 lbs. We couldn’t forget any LSU players now, could we? Keep an eye out for defensive tackle, Brockers. He is at the top of a talented group of defensive linemen who will be entering the draft. Brockers is a 300-pound monster with cat-like agility, in addition to his strength and mass. He holds a skill-set that virtually no other defensive tackle can match, and if he dominates at the combine, he could find himself in the top 10 draft pick. “Linsanity” vs. “TebowMania”: Taking the World by Storm? 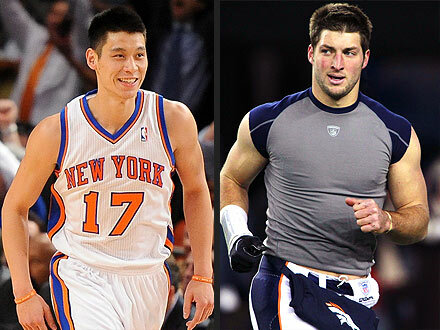 Is Jeremy Lin the Tim Tebow of the NBA? Right now, he is. How does a virtual nobody (an undrafted free agent from Harvard with no athletic scholarship and no athletic awards) suddenly take the league by storm? Lin was sleeping on his teammate Landry Fields’ couch just a week ago; he is now living in David Lee’s (former Knick) apartment, which is the same plush apartment once occupied by Amar’e Stoudemire before he moved to Manhattan. When Lin finally got the chance to perform due to teammate injuries, superstar egos, and a poor team record, he showed he was a true superstar. More importantly, he has rallied the Knicks to a seven game winning streak! The excitement surrounding Lin’s clutch game-winning shots and record-breaking points has captured the world’s attention. In Asia, he is the most searched item on various Chinese search engines. Lin’s Twitter followers erupted from just 25,000 to 300,000 in less than two weeks. Quite the popular guy, considering just two weeks ago Lin was about to get cut by his third NBA team. Tim Tebow also took the nation by storm during the NFL season. Tebow was EVERYWHERE, and his hard work and determination in the face of critics only seemed to make him more successful. It is easy to point out the similarities between Tebow and Lin. For one, they both started on the bench at the beginning of their seasons. Each have been the force leading their losing teams on unexpected winning streaks. Both Tebow and Lin have used their sport as a platform for their belief in God; they are both Christians, and appear to live wholesome lifestyles. Tebow had high expectations placed on him (recruited out of high school, Heisman trophy winner as a junior, and first round draft pick), while Lin had no expectations placed on him. Both are underdogs, but I see Lin as more of an underdog and Tebow as unorthodox in the way he plays football. Together, they have both given people a reason to believe. They both speak about their teams first, and appear to be very humble. Aside from also saving two coaches whose jobs were in jeopardy, these two athletes have captivated the world and will continue to do so. Eli Manning and the New York Giants defeated the New England Patriots once again in the NFL’s biggest stage: the Super Bowl. The stars aligned Sunday as the rematch of 2007’s Super Bowl was set for Tom Brady to get revenge on the Giants on his quest for his fourth ring. Eli Manning took the Giants from down 11 points to victory with his final touchdown drive with 4 minutes left in the game at his brother’s home stadium. He now has his second Super Bowl ring with only 8 seasons under his belt. The question now becomes, is he better than his brother Peyton? No, but he has been getting closer. Peyton Manning deserves to be MVP this year, not Aaron Rodgers. The Most Valuable Player award should be renamed because Peyton Manning was most valuable player not to play this year. Yes, Aaron Rodgers was possibly the best quarterback in the NFL this year as he led the Packers to a 15-1 record, but we all saw what happened when the Colts lost Peyton to a severe neck injury. Peyton has been winning games with a high-powered and complex offense that has been his brainchild for quite some time. He has had some good defenses with the Colts that helped him get his only Super Bowl ring, but this year we saw that Peyton IS the Indianapolis Colts. Without him the Colts completely imploded this season as they had the NFL’s worst record at 2-14. Eli Manning has dealt with plenty of expectations in his NFL career. He was drafted by the San Diego Chargers in 2004 but demanded a trade. Manning was traded to the Giants immediately as he voiced that he had no intentions to play in San Diego. As the number 1 overall pick in that 2004 draft, he had a ton of expectations: not only did he faces large expectations as the franchise quarterback, being son of legendary Saints’ All-Pro quarterback Archie Manning, but also being the other Manning in the NFL as his brother Peyton was doing big things as an Indianapolis Colt. It seems as if every time Peyton does something big, Eli counters with something even bigger. This is your typical little brother trying to impress the big brother. When Peyton won the Super Bowl in 2006 against the Bears, Eli responded the next year and beat the Patriots in the 2007 Super Bowl. There you go, back-to-back Manning Super Bowl MVPs: “How do you like me now, Peyton?” This year was supposed to be Peyton’s year as the Colts were coming off of a 10-6 season and the Super Bowl was coming to their home stadium. Well, something big happened to Peyton as he had a neck injury that left him out for the season. Flash forward 5 months and Manning is the Super Bowl MVP in Indianapolis: no not Peyton, yeah you know who. What will happen this season if Peyton comes back healthy, and possibly on a new team? Will it be called the season that “Peyton Strikes Back”? Yeah it sounds like a movie title, but what will Eli do in the sequel “Return of the Eli”? When, Peyton goes into the Hall of Fame, how will Eli do bigger? No matter what happens in the future, right now all we can say that Eli Manning is no longer in the shadows of his big brother.